Sir Elton John has revived his feud with Madonna in spectacular style. In a foul-mouthed tirade on Australian TV, Elton described Madonna as "a fairground stripper" and suggested her career was on the slide. He is unimpressed with the way Madonna has treated Lady Gaga, who is his friend and a supporter of his AIDS charity. When Madonna’s name was mentioned on the Sunday Night show, Elton let rip. "She's such a nightmare. Sorry, her career is over. 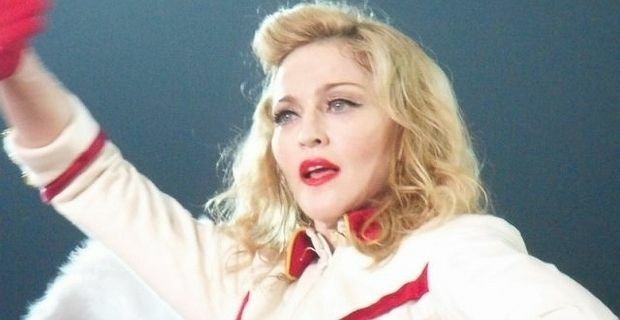 Her tour has been a disaster and it couldn't happen to a bigger c**t."
Elton thinks that Madonna’s recent MDNA album was a misguided attempt to revisit her youth. "If Madonna had any common sense she would have made a record like 'Ray Of Light' and stayed away from the dance stuff and just been a great pop singer and make great pop records, which she does brilliantly. But no, she had to go and prove she looks like a f**king fairground stripper. She's been so horrible to Gaga." He has never been shy of having a pop at Madonna. In 2007 he accused her of lip-synching rather than singing live. His partner David Furnish also tweeted his disgust when a Madonna song finished ahead of an Elton John composition at an industry awards ceremony. They had a brief making-up in 2010, but it seems unlikely that we can expect an Elton John-Madonna duet to be happening anytime soon. Unless he comes up with a heartfelt ditty about a fairground stripper . . .